Hi Friends: It's time for our very first challenge over at the SheepSki Designs Challenges Blog! The theme for this month is Anything Goes. Here's my project for this month's challenge - I used this beautiful digital stamp called Dream Dress from SheepSki Designs. Print image onto smooth white cardstock and color with Spectrum Noir markers. Cut image with stitched rectangle die and back with craft foam for dimension. Add some glimmer to the dress with the clear and silver glitter brush pens. Add some pearl gems to border the focal image. Using the Something Blue paper pack, cut papers to fit an A7 card base, ink edges, and add to card. For the border strips, emboss with embossing folder and use some Old Silver Inka Gold paste to enhance the texture, ink edges and add to card - the paste gives some lovely shimmer to the border - you can see it at the top of the photo - it can be so hard to capture the shine in a photo. Cut the 4 corners of coordinating paper panel using the lace corner die and add to card. Add strips of lace at top/bottom edges where the base layer and border strips meet, and in center of die cut panel. Cut a square of glimmer paper using larger stitched rectangle die and add to card center, then add focal image to center. Finish with heart gems colored with the Spectrum Noir markers, and a small ribbon bow. 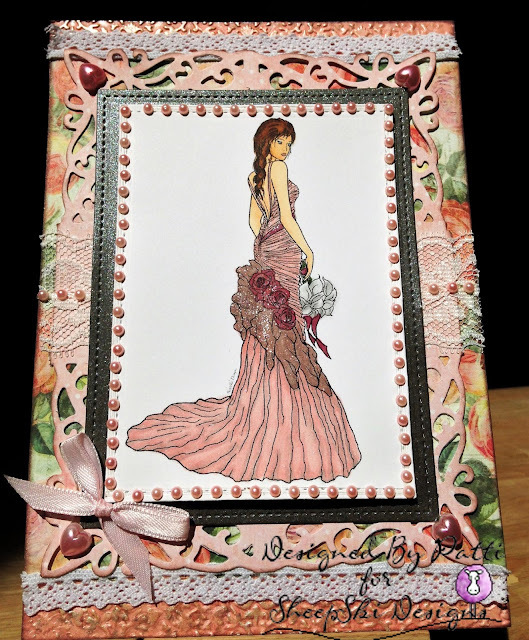 Gorgeous creation Patti, love the colors, die cut, lace and pretty pearls!